Shared Topic: Triage and You! This topic is the weekly Shared Topic over at Blog Azeroth! If you want to join this awesome group of awesome WoW bloggers, head over to the website and sign up! See how simple that is? Umm… well… It was simple when I thought of it. Allow me to attempt to simplify! Ahem. DON’T BE STUPID AND YOU WILL BE HEALED. Does that work? However, I don’t just play a healer. Less we forget the sheer awesomeness that is Puff the Gnome Death Knight! There we go! That should clear things up pretty much. So there you have it. A simple way to decide whether or not to heal or not to heal for both actual healers and Death Knights. However, I should stress that these do not hold up always in a raid environment. Because in a raid environment, you can always just let the other healers deal with it, and then blame them when it goes wrong. Not that I do that, but it is a valid strategy when it comes to triage. Posted on July 7, 2010, in Photo Fun and tagged death knight, healer, shared topic, triage. Bookmark the permalink. 14 Comments. That’s an automatic die, really, because I will mana back up to full before I start healing you. Otherwise I liked the charts very much. Nice flowcharts! They -are- very colorful. 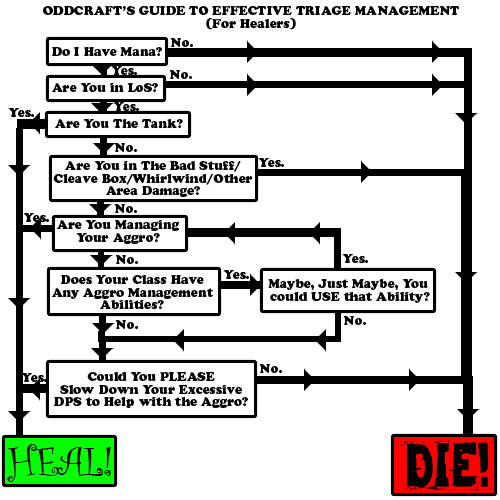 Realistically, the second flowchart is accurate for any DPS class. With very few exceptions, a dps should play with this priority in mine: first, stay alive; second, maximize damage (aggro managment comes under the first category). We might make fun, but a smart dps (even so-called-selfish dps priests) plays by that chart. .-= Evensong´s last blog ..Why do you play your class =-. .-= Ringo Flinthammer´s last blog ..Ultimate triage =-. Well, if it’s the tank that’s not in LoS (for a somewhat decent reason) it might not be a bad idea to move over to them and heal them. DPS that are out of LoS annoying me very much. I’d still try to heal them, but I’m too nice. .-= Tomkr´s last blog ..PvP Retribution Spec =-. Yes, the key is a somewhat decent reason. Pulling around a pillar? Yea, I can step two steps and heal you. Running down the hall and pulling the next room before the healer has even noticed you left previous room? No. No mercy. 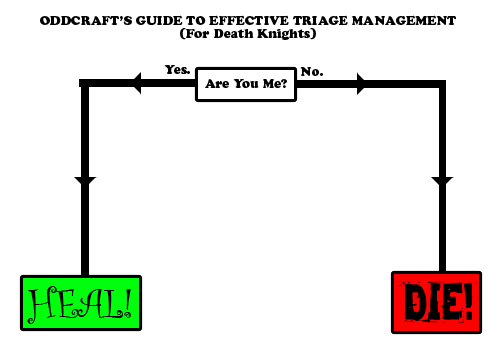 More incoming love for the flowcharts. Plus, they are pretty…how do you make them? I want to include more such things on my blog, but I am technologically intimidated. .-= Ecclesiastical Discipline´s last blog ..Avoidance &amp Reality =-. I make them in photoshop fairly easily. Just using the marquee tool to make the lines and boxes, the polygonal select for the arrows, and then adding the black outline in the layer options (It’s like stroke or something if I recall). These two took me about 20 minutes to do after I had figured out on paper how to lay them out properly.